UofM BURTON TOWER UofM photo picture print photograhs for sale. BURTON TOWER photo art photography print for sale. BURTON TOWER photographs art photo picture prints for sale. 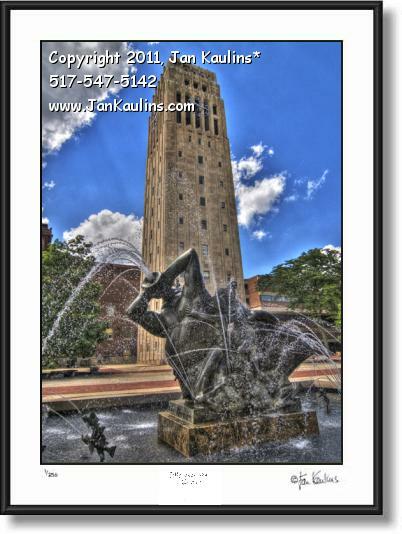 BURTON TOWER Ann Arbor UofM photo art print photograph for sale. This is a wonderful wide angle colorful portrait BURTON TOWER photo art print. In the foreground is the spraying water fountain of Neptune surrounded by nymphs and jumping fish. (This fountain is titled "Sunday Morning in Deep Waters." The tradition is that when you start at U of M, you're supposed to walk in the fountain heading towards the library, signifying the pursuit of education. Then when you've graduated, you're supposed to walk through heading towards Rackham, representing graduate education and the path towards graduate degrees.) The HDR photographic process uses nine seperate exposures to create this one image and by doing so captures the movement of the water drops as they cascade back into the fountain. Also, the bright rays of the sun can be seen shooting down through the brilliant blue sky towards the white billowy clouds above. Burton Tower is a historic UofM University of Michigan landmark and home of one of the world's great Carillons. This beautiful photo, with it's unique perspective and striking colors and sky, is a visual feast for the viewer.